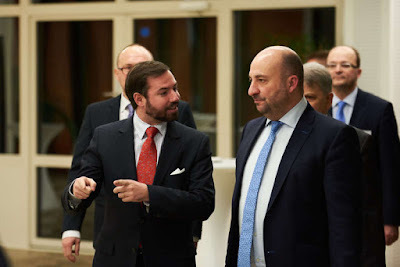 On Thursday night, the Luxembourg Maritime Register celebrated its 25th anniversary at the Chambre des Métiers in Kirchberg and Hereditary Grand Duke Guillaume was on hand to celebrate with them. The event, which was organised by the Commissioner for Maritime Affairs and the Luxembourg Maritime Cluster, included three presentation on the historical evolution of the Luxembourg maritime flag and its importance in Luxembourg's multi-sectoral policy of economic diversification, migration of refugees in the Mediterranean, as well as the role of the European Maritime Safety Agency to strengthen the global system of maritime safety. More pictures at the cour, more info at Chronicle.